So it's January, sooo new year, new start right? Why does it sometimes feel like nothing changes though, or that the things you wish would change just don't? Like there are things you can personally control...I can try my hardest to blog more frequently in 2016; I can try to cook dinner more frequently; I can be more proactive about planning out my lunches; or you know the normal I can aim to be more healthy and workout more in 2016. There are some things though that you really, really wish you could change, but that you have zero control over. But, truthfully I will always keep trying to change some of those things whether at work or when I once again let my blogging fall off because sometimes life just gets too busy. What is it that you want to change in 2016? For me the questions is...what do I want to accomplish before I turn 30 in August? Bungee jumping anyone? 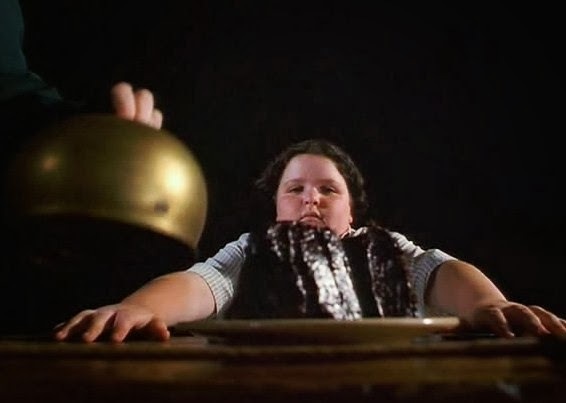 Okay down to the food, and this time I mean cake, three layers of rich chocolate-chocolate, straight out of the movie Matilda, chocolate cake. BUT I did make this just a bit more grown up, so this is actually a chocolate lavender cake. This cake is moist, light and fluffy with just a hint of lavender flavor, with rich fudgy chocolate frosting that is worth licking the spatula over. You might be thinking that you don't really like lavender, or even...SERIOUSLY lavender in a cake?? But this cake even changed my mind. So give it a try and Enjoy! This is the Matilda Cake I was talking about. I have come to realize that there will always be people in life that you don't know what you would do without. Sometimes, a person's role shifts and changes, but there are others that you know deep down you just need. They are the people whose opinions you care about the most; the people you would do anything for at the drop of hat. They are the people I want to bake for "just because." Thalia at Butter and Brioche put it best I think, and I agree with her about the power of baking. Baking..."It brings delight to taste buds, provides happiness and nourishment to heavy hearts, comforts those hurt and unites loved ones. It is the language of connection, a labor of love…a small and everyday act that is one of the most powerful ways to show another person that you care for them." This year I resolve to get back to the love of baking; back to the days and nights and weekends when I looked forward to it. For it to not feel forced and like something I "have" to do. So this year I am starting with something I wanted to make just because I wanted to eat them...cinnamon chip scones that is. These are light, and moist for being a scone, with great cinnamon flavor and texture. The cinnamon chips are the perfect little breakfast treat. Definitely give these a try and Enjoy! P.S. Now is the time to get cinnamon chips at the store. They are found near the chocolate chips in the grocery store.